Bow Valley officers issued roughly the same number of speeding tickets, about 525, over the May long weekend as they did last year, RCMP say. 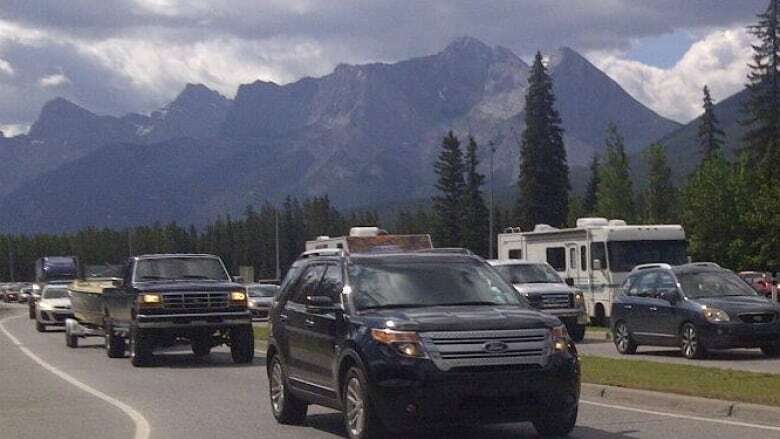 Traffic was hectic on Alberta highways this May long weekend but, for the most part, drivers were obeying the speed limits in Banff National Park and on the way there. RCMP Cpl. Chris Blanford spends a lot of time on Highway 93 North, also known as the Icefields Parkway, for his work with the Bow Valley Integrated Traffic Services Unit. Traffic police saw a few "high-flyers," he said, but the roads were quieter than in past years. "It was actually very nice to see," Blanford told the Calgary Eyeopener on Tuesday. "I'm used to seeing speeds between 120 and 130 [km/h] on that highway of the speeders that we're catching. "And this weekend between 110 and 115 [km/h] were the people that were speeding." Bow Valley officers issued roughly the same number of speeding tickets — about 525 — over the May long weekend as they did last year, he said. In 2017, they issued 522 tickets on the long weekend; this year, it was 527. Despite most people being "well-behaved," police caught two drivers going 67 km/h over the speed limit — that's 157 in the 90 km/h zone. One was driving a commercial van and the other a car. "It's not the big, jacked-up trucks, although we did get a few of those this year," Blanford said. "But no, it's just your normal passenger vehicle that is a problem." Other drivers were caught going between 51 and 65 km/h over the speed limit, he said. The region was busy also because thousands attended Slush Cup at Sunshine Village Ski Resort, but he said officers laid no alcohol-related charges. The weather was warm and sunny all weekend, encouraging many to enjoy the outdoors.